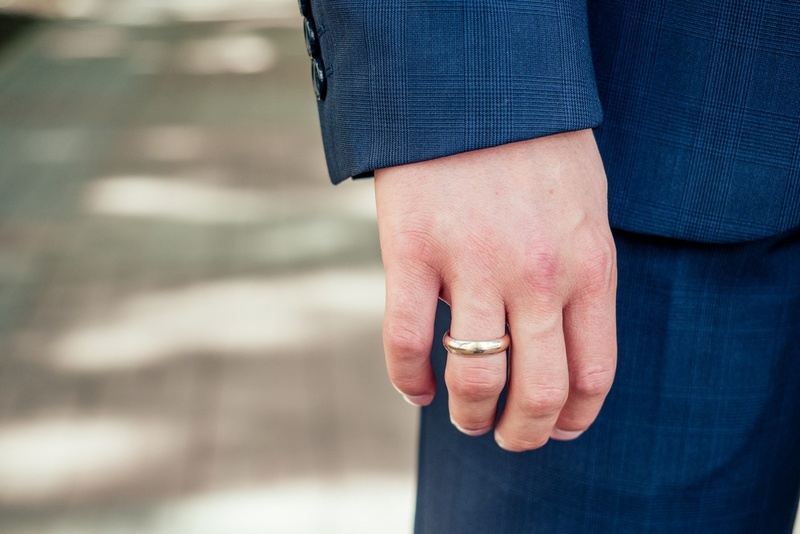 Men have a seemingly unlimited number of choices when it comes to the wedding band metals. The variety of choices can make shopping for the best men’s wedding bands quite intimidating. This is especially true for men who weren’t expecting to have so many options to choose from. The best way to begin your search is to learn about the metals that are used to create wedding bands so you can decide which one is right for your lifestyle. 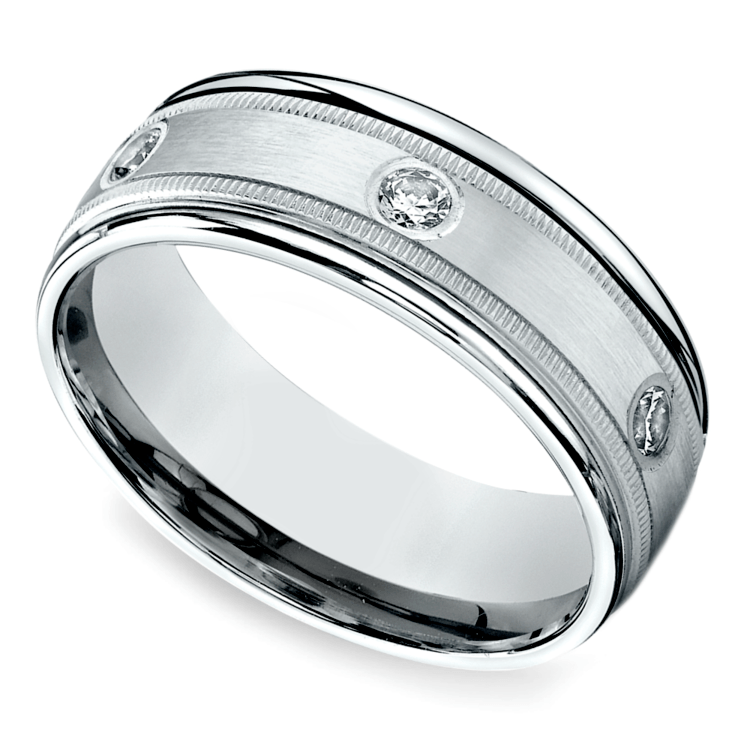 The most popular metals for men’s wedding bands are gold, platinum, palladium, tungsten, titanium and silver. Each metal has its own strengths and weaknesses, so choosing the ideal metal type depends on your man’s personality and lifestyle. Many of the best men’s wedding bands are made out of yellow gold, rose gold, or white gold. 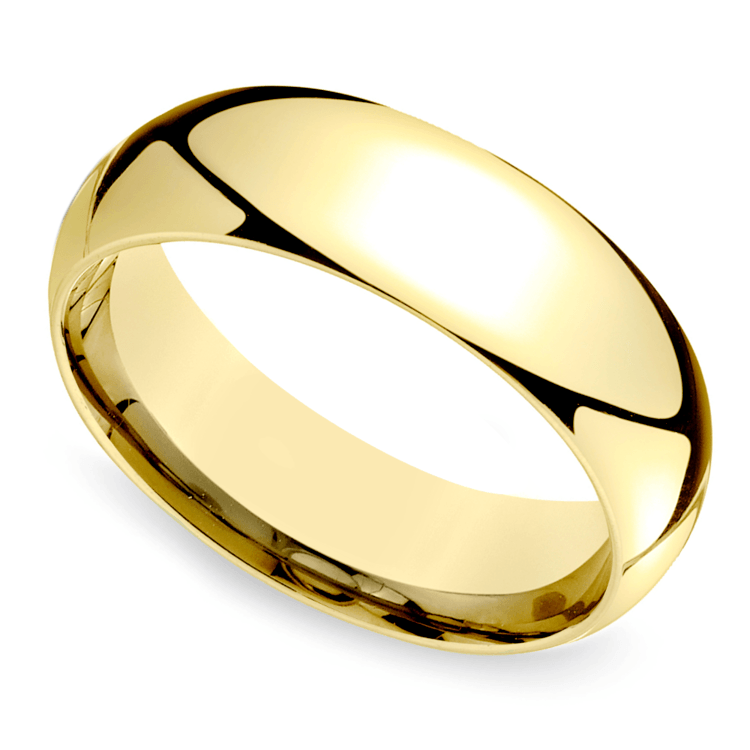 In fact, gold is the reigning champion of men’s wedding band metals. All gold is mixed with other metal alloys for additional strength since pure gold is extremely soft and unsuitable for daily wear. Gold bands are all measured in karats to denote their purity. For example, pure gold is 24-karats, whereas 18-karat gold is about 75% gold. Most fine jewelry—including men’s wedding bands—should be purchased in 14 karat or 18 karat gold. Any piece of jewelry below 14 karat gold means that the purity is less than 50 percent gold. Yellow gold is a classic choice that works well with both vintage and modern men’s wedding band settings. Although anyone can pull of a yellow gold wedding band, it really stands out on men with darker or olive skin tones. White gold has a cool and contemporary look that complements fair and rosy skin tones well. White gold is often considered the most timeless of all colors of gold. Rose gold gets its signature hue from copper, which is combined with pure gold to create this metal. Rose gold is often used to create vintage-inspired men’s wedding bands, however it is also frequently found in modern, mixed metal settings with white or yellow gold. Because of its soft pink color, rose gold rings typically look warmer and more romantic. Don’t let its soft color fool you, though. Rose gold is actually the most durable type of gold since it contains copper, a sturdy and strong metal. Gold in all purities and colors will scratch and bend, so rings crafted from gold will need to be polished or buffed on a regular basis as signs of wear and tear begin to appear. Platinum is one of the rarest metals in the world, so it’s no surprise that it’s also one of the most expensive metals on the list. This white, mirror-like metal was at one time an extremely popular metal for jewelry. However, it was later rationed for war time. When platinum could no longer be used for jewelry, white gold was created as a less expensive equivalent. Since the late 90s, however, platinum once again emerged as one of the leading wedding band metals. A “pure platinum” band has at least 95% platinum, and should be stamped to indicate its purity, typically in the form of a parts-per-thousand number. For example, a piece with 90% platinum and 10% alloys would be marked “900” or “900PLT,” to indicate 900 parts platinum out of a 1000. Its high cost makes it a luxe choice, but its durability makes it a sensible choice. Platinum is one of the strongest precious metals in the world. Platinum rings will show minimal—if any—signs of wear and tear even if they are worn everyday. If your ring is going to take a lot of wear and tear, platinum is an ideal (and practical) investment. This metal retains its color over time as well. Unlike other metals, there’s no need to replate platinum in order to restore its original beauty. The beauty of this metal will not fade, which means you can enjoy its shine and luster for years to come. A close relative to platinum, palladium also features a similar white hue and high shine. Although this metal isn’t quite as durable, it is less expensive. For men who want the look of platinum and a similar durability, palladium is a fantastic choice. Rings crafted from palladium can feature diamonds, gemstones or engraved details. This metal is also extremely versatile and can take the wear of an active lifestyle. In fact, men often forget they’re wearing it since it is so lightweight and comfortable! Palladium is also one of the few hypoallergenic metals available. If you are allergic to nickel, you won’t have to worry about skin irritation or discomfort with a palladium wedding band. Tungsten is a precious metal that is highly resistant to scratches, making it ideal for men who work with their hands. In addition, this metal never tarnishes, which is why it’s loved by so many low maintenance men. 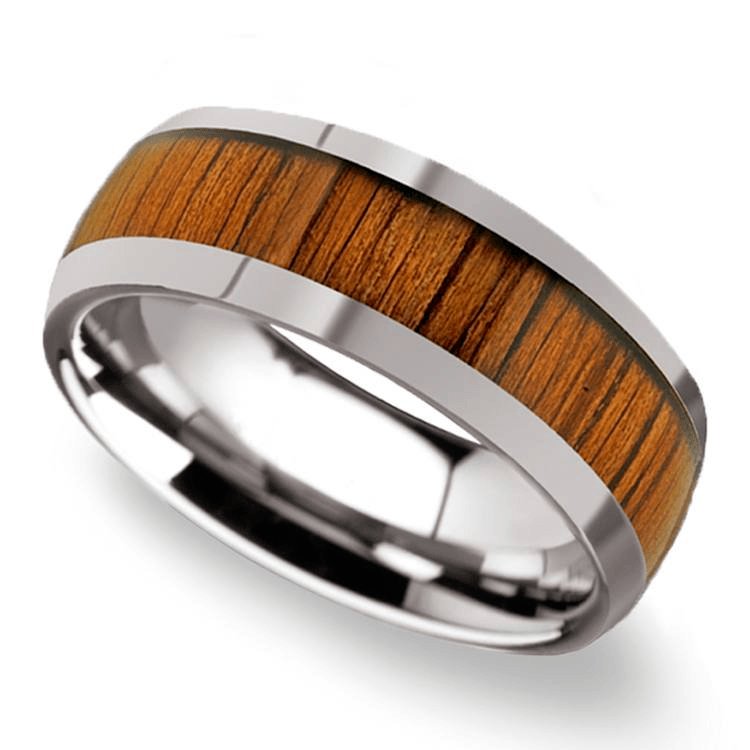 Men’s tungsten wedding bands can be found in white, gray, and black, and are often designed with creative inlays like wood and colorful opal. 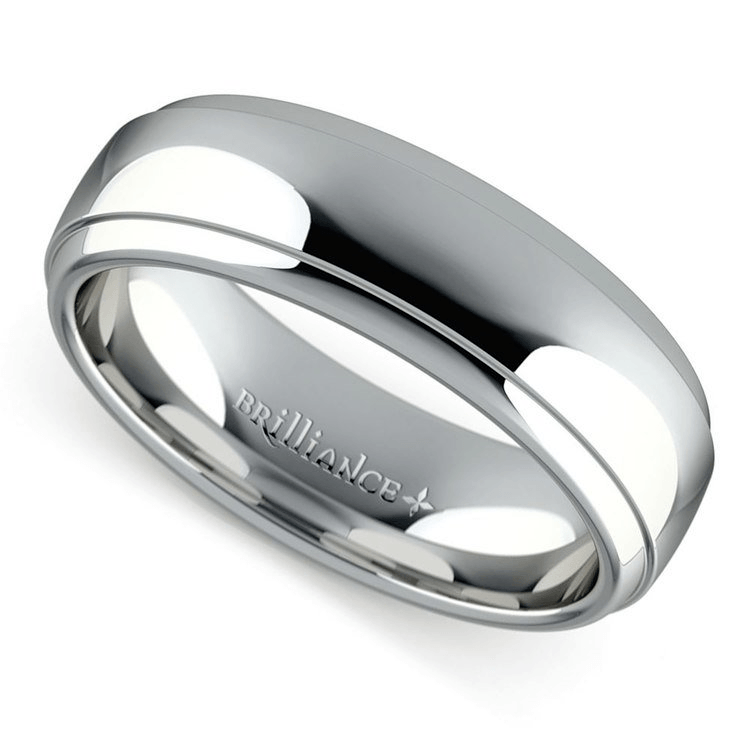 Tungsten bands can also incorporate imprints, laser engravings and other personalized details. Because of this, tungsten rings often feature the most unique designs found on men’s wedding bands. It’s important to note that tungsten rings cannot be resized. Therefore, make sure you know your man’s correct ring size prior to purchasing a tungsten ring. 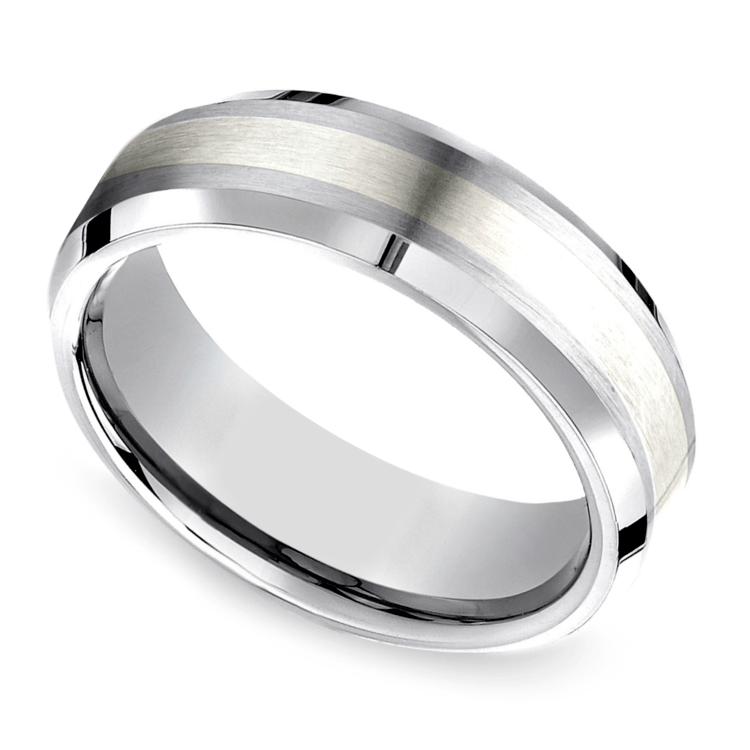 In the past few decades, titanium has become incredibly popular for men’s wedding bands. Titanium is an incredibly durable metal that is as strong as steel but much lighter in weight. For this reason, titanium is perfect for men who live active lifestyles. Titanium wedding bands often feature unique inlays, etchings, and other beautiful details. The design options are endless when it comes to titanium rings, so you shouldn’t have any trouble finding one that’s perfect for you. Titanium has a silver-white metallic color that looks sophisticated and chic. But, that’s not the only color of titanium available. 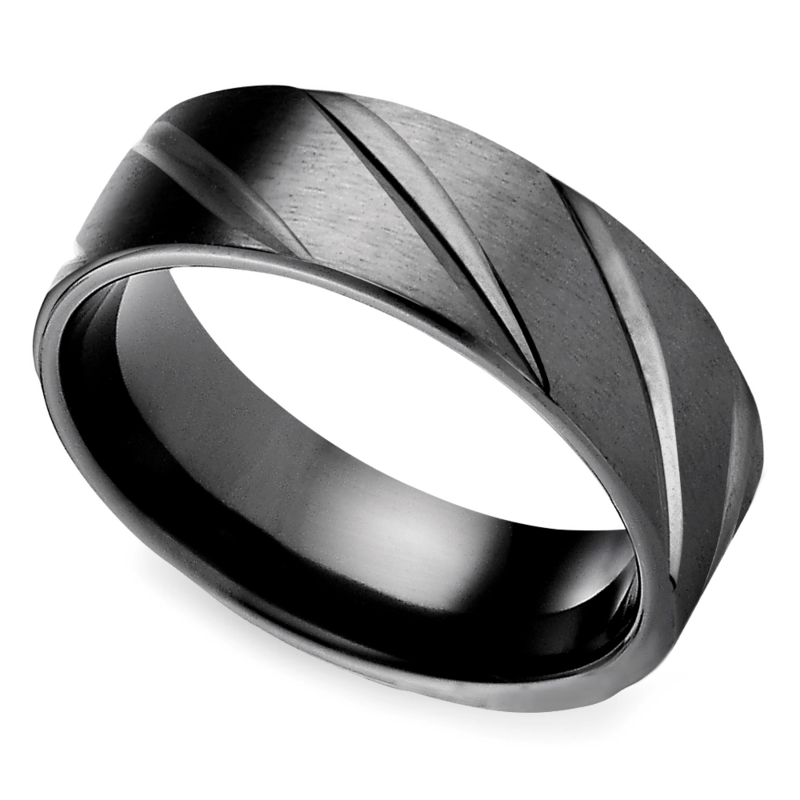 Grooms seeking an alternative to white metal can set themselves apart with an edgy, black titanium ring. Silver, or sterling silver, is one of the most well-known metals in the world. Many people are drawn to this option because of its affordability. Silver is the most inexpensive metal that is used to create the best men’s wedding bands. Silver’s affordability makes this metal very attractive, however there are some drawbacks to this option. Silver is a high maintenance metal, which means it requires a lot of upkeep. This metal will start to tarnish over time, so it will need to be polished and cleaned on a regular basis. It also scratches fairly easily, so you may notice signs of wear and tear much sooner than you expected. Although silver is not as durable or low maintenance as other metals, it is a good option for those who are working with a tight budget. Plus, silver is similar to white gold in appearance. Purchasing a silver ring is a great way to pull off a high end look with a much smaller budget. While there are numerous metal choices for men’s wedding bands, the ideal metal should suit his personality and lifestyle. All metals have strengths and weaknesses, but they can all create the ideal ring. The metal that you select for his perfect ring should fit his hand, his life—and, most importantly, your budget.